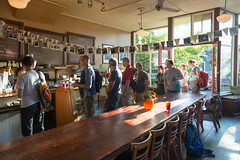 Located in what used to be a small neighborhood grocery store just down from Volunteer Park, the Cafe is in a quiet little neighborhood, quiet enough that a group of a dozen people waiting for them to open at 8am on a Saturday morning was not a common sight for the locals or the workers. But as we filed in right after they unlocked the doors, they rather efficiently took everyone’s order, and we soon found ourselves enjoying our morning beverages at the big, central common table while waiting for the food to arrive. The menu at Volunteer Park Cafe is one of those things that really varies by the time of day. For breakfast and lunch, it’s a fairly relaxed order-at-the-counter place with a selection of sandwiches and light dishes. Dinner is a bit more substantial, but casual, unless you are there on Sunday when they do up a fairly old school Sunday Supper with a three-course dinner. 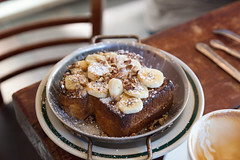 Being breakfast, most everyone in our group gravitated towards one of two dishes: either the bacon and egg panini, or the banana brioche French toast. 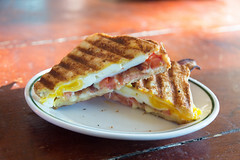 I opted for the former, and I was quite pleased with it as a breakfast: Two very nicely poached eggs served up with fresh ripe tomatoes and gruyere on a nicely-toasted panini, this was basically just a near-perfect execution of a classic breakfast sandwich (I thought it could have used a bit more seasoning, but easily remedied with a shake of salt and pepper). And I’ll have to admit, I had a bit of breakfast envy for those getting the French toast, since that was a rather generous serving of brioche, stuff with ricotta cheese (with a hint of both vanilla and orange), served with a drizzle of syrup, slices of banana, and a good handful of nuts. Most everyone that got this enjoyed it as well. And, somewhat true to form for what we’ve observed with Seattle… by the time we left around 9am, the place was actually starting to get crowded. So even this quiet corner of Capitol Hill picks up once everybody is done sleeping in for the day. In any case, it’s definitely a neighborhood gem. we used to live almost directly across the street from this place–we used to call it the Pink Grocery since it used to be painted bright pink on the outside. 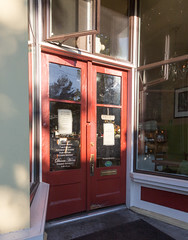 It went through several hands while we lived in the neighborhood–each making more improvements– so it is nice to see that it has succeeded in its latest incarnation. We still talk about the cinnamon rolls they sold back in 1994 which were laced with equal amounts of cinnamon and cardamom. Thanks. Good to hear about some of the older history of the place.